A native Floridian, Pam was raised in an Air Force family. it was no surprise to those who knew her that she joined the Air Force in 1980. Her twenty-five year career serving our country took her to Kuwait, Oman and the United Arab Emeriates as well as Johnston Atoll (a small island 853 miles from Hawaii) for a year. 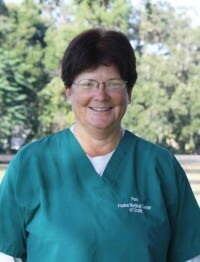 Pam retired in 2005 and returned to Florida to be close to her family. Her son, Rusty, lives here in Florida as well as her daughter Jamie and her husband and their four children. Pam has four dogs and five horses. Days off from her work at the clinic will find her riding on some of Florida's wonderful trails with her twin sister. Reality TV (The Amazing Race) is a favorite pastime. Laughter and time spent with her family give joy to her life.